Nipper’s Beach Bar is no humble beach bar. It is a destination in and of itself, and something that anyone who is heading to Abacos, Bahamas must try for themselves. Nipper’s is not to be experienced quickly, just stopping off for a cold drink and a quick bite. Rather Nipper’s should be savored; let the atmosphere draw you in so that you become a part of its culture rather than just a casual observer. We’ve been hearing about Nipper’s Beach Bar for years. It has a worldwide reputation among yachtsmen, who flock to the Bahamas. We had to find out for ourselves what all the hype was about. Menu: Nipper’s Beach Bar offers enticing Bahamian favorites for lunch and dinner. The lunch menu is simple, consisting of cracked conch, fresh fish, cracked lobster (in season), and chicken. You can choose between sandwiches or platters, served with French fries and coleslaw. The dinner menu offers more choices, including grilled rib eye, grilled lobster tail (in season), sautéed fish of the day, and coconut shrimp. To fully experience Nipper’s, you must come on Sundays for the Pig Roast Party. People journey to Nipper’s from all the surrounding islands for this renowned buffet party. Served from 12:30 to 4:00 pm each Sunday, you can eat your fill of roast pork, BBQ pork, peas & rice, baked mac & cheese, and other Bahamian delights. 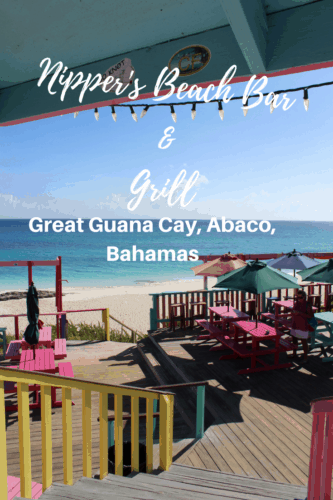 Thoughts: If you are not staying on Great Guana Cay, you can still experience Nipper’s Beach Bar! Many tour companies offer trips to Great Guana Cay and the Wild Pig Roast at Nipper’s on Sundays. Grab your towel, swimsuit, hat and sunscreen and head to Nipper’s for the day. With a laid-back casual island vibe, it’s the perfect way to spend a day. Open from 7 am until the last patron leaves 364 days a year, Nipper’s is a must-do when you visit the Abacos. Built right on the dunes, you are virtually steps from the ocean. Bring your snorkel gear and explore one of the best stretches of the Great Abaco Reef and see elkhorn, brain, and star coral in their natural environment. Nipper’s is family friendly, so bring the kids. After your fill of beach time, head up to the bar area, to colorful picnic tables and umbrellas. Grab your favorite libation from the bar, or try one of Nipper’s famous juice drinks, and slip into one of two pools to float the afternoon away. If a tune or two gets your feet to dancing, grab your partner or a new friend and hit the dance floor for a spin or two. Stake a place up on the covered viewing platform for a great place to people watch, relax and chill out with an incredible panoramic view of the harbor as you sip your favorite cold drink. Nipper’s Sunday Pig Roast has often been described as a “Spring Break party for adults.” With strong drinks, one can imagine what can happen…. And what experiences you can savor at Nipper’s Beach Bar. Price Range: $14 to $20 for main lunch entrees; $22 to $37 for main dinner entrees; $20 for Sunday’s Pig Roast. All menu prices are VAT inclusive. Accommodations in the Abacos Islands in the Bahamas range from deluxe resorts to small vacation rentals. Get information and reviews to book your accommodations in this islands here.